Trend Filtered Cigars are packed with pure, high-quality tobaccos, offering a smooth, rich and captivating smoke. Each of these discount filtered cigars are infused with the finest blend of high-grade tobaccos wrapped in natural tobacco paper and capped off with longer filters. Trend Filtered Cigars give a satisfying experience to every smoker with their quality natural slow burn with a taste that is smooth, mild and aromatic. Choosing Trend Filtered Little Cigars is a great alternative to expensive and over-priced retail brands. Trend Filtered Cigars are offered at our online tobacco store in unique styles to choose from. Currently available: Full Flavor and Smooth. Every day smokers are switching to filtered little cigars not just for their great inexpensive prices, but for their quality and superb taste. 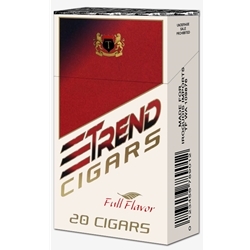 Trend Filtered Cigars offers an excellent choice for your smoking needs. Smokers Discounts has made it easy and affordable to buy filtered cigars online. Call us for more details!